What is Elin’s Story and what is The Long Way to London? Elin’s Story is my working title for a suite of historical novels based on a true story and set in England and northern Europe in the period 1563 to 1576. The Long Way to London is the first of these novels. It tells the story of how the fatherless Elin Ulsdotter becomes a Maid-of-Honour to Swedish Princess Cecilia Vasa in 1564. The Princess is 24, beautiful, selfish and wilful. She has a fan crush on the English Queen Elizabeth who is just six years older than her. 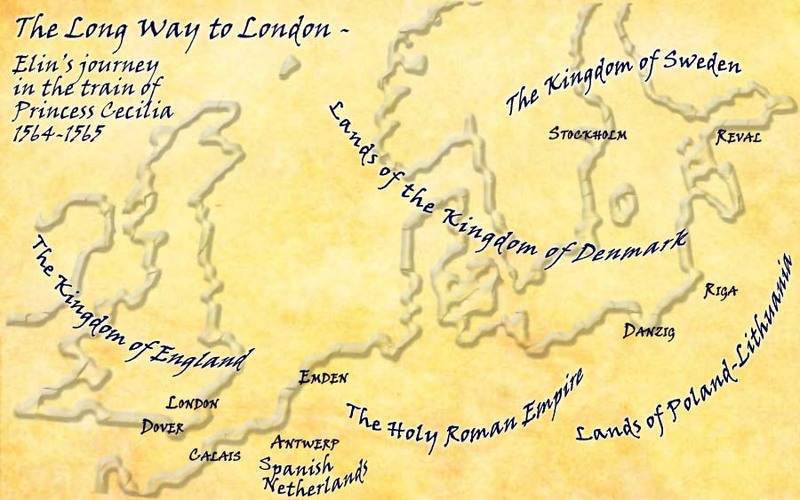 Blocked from travelling to London by sea because of the war Sweden is fighting with Denmark, the Princess takes her Maids on a 10 month long, dangerous journey to London “the long way” by way of the Baltic Sea, northern Europe and the English Channel. The story is told mostly through Elin’s eyes with a little input from a couple of other characters. Read a longer synopsis of the story here. Elin’s journey in the train of Princess Cecilia went from Stockholm in November 1564 to Reval (Tallinn). Then on to Riga, Danzig, Emden, Antwerp and Calais. They finally reach Dover on 8th September 1565. The novel is fiction, but it’s based on a true story. Both Elin and Princess Cecilia were real people and the Princess’s journey with her Maids to London really happened. In London the Princess was first feted and then hated, and was chased out of the country by her debtors. Her love of England turned to hatred. This is the subject of the second novel in the series. Meanwhile Elin remained in England as a Maid at the court of Queen Elizabeth. When she was 21 Elin married Queen Elizabeth’s uncle, the elderly William Parr. On his death, five months later, she returned to the Queen’s Court as a Lady-in-Waiting. Now known as Helena, Marchioness Northampton, she was one of the small circle of noblewomen around the Queen. This is the subject of at least one of the later novels in the suite. In 1576 Elin married, secretly, one of the Queen’s Gentlemen. Found out, she was accused of high treason – for a Lady of the court to marry without the Queen’s permission was against the law. High treason carried the death penalty. In Elin’s Story, Elin is pregnant with her first child as she waits under house arrest for the Queen to decide what to do with her. While she waits, she writes the story of her life for her unborn child. I was researching into descriptions of Sweden written in English, trying to find the oldest. That turned out to be The Description of Swedland, Gotland, and Finland etc. by George North, published in London in 1561. Trying to find out about George North, I learned he was Princess Cecilia’s English teacher on the journey from Stockholm to London. That got me looking for an account of Cecilia’s journey, which introduced me to Elin. If you go looking for Elin on the Internet you will find her most often as “Helena Snakenborg, Marchioness of Northampton”. What did Elin look like? If we are talking about the historical person, the short answer is, we don’t know. The only physical description of her that exists dates from her wedding in 1571. A witness to the wedding writing to a friend describes her as “a beautiful German girl”. Elin was supposed to bear a striking resemblance to Elizabeth Brooke, William Parr’s second wife and a close friend of Queen Elizabeth. Elizabeth Brooke died (of cancer) in April 1565, about four months before Parr met Elin. Finding a description of Elizabeth Brooke – or better still a portrait of her – might give a hint of what Elin looked like at the time, but again I draw a blank. The medallion currently illustrating Elizabeth Brooke’s Wikipedia entry is not much help. If her name was Helena Snakenborg, why do you call her Elin? First, Elin is the Swedish form of Helen and in the 1500s the “H” was silent both in Swedish and English. Elin herself, as a 15-year-old, signed her letters “Elin Ulsdotter”, so we know that this is what she called herself. Later on, as she grew up and lived in England at the Queen’s court, she seems to have changed to writing her name as Helena, but in The Long Way to London, she has yet to get to England. Secondly, at this time in Sweden people did not generally use surnames. They identified themselves by their given name and by their patronym, just as most Icelanders still do today. Elin was Ulsdotter or Ulfsdotter – the daughter of Ulf. Her brother Göran, who came to England to witness her wedding in 1571, called himself Ulfsson. We know this because in English documents of the time he is named as “George Wolf”. Once again, though, at the time of The Long Way to London, this is all in the future. I’ll add to this page as more questions come in. Ask!